Preliminary sales reports received by Benton Lefton, head of the California Golden Empire, indicated that 50% of the available lots developed to date in the first phase of this 30-square-mile planned community have already been sold on a reservation basis – less than 90 days after of land development was announced. 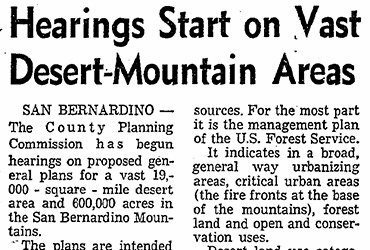 Public response to the California Golden Empire, located in the high desert 120 miles northeast of Los Angeles near Yucca Valley, has been great. 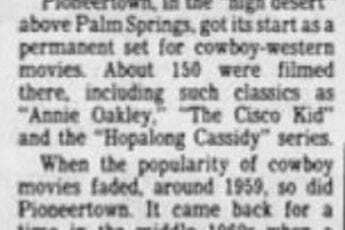 Each weekend thousands of people have been visiting the Pioneertown, the “Capital” of the Golden Empire. The beauty and growth potential of this high desert development are combined to effectively “sell” this California Golden Empire to many people, a spokesman said. The California Golden Empire will offer 15,000 lots for sale in the projected future. 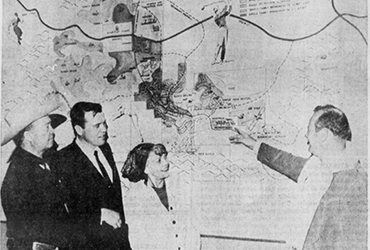 Sales managers Frank Bradley and Earl Plumley reported from Pioneertown that they anticipated an even greater influx of visitors.